This chapter reinterprets the most well-known civil rights play, A Raisin in the Sun (1959), arguing that playwright Lorraine Hansberry situates the fight for civil rights firmly within black left feminist politics. In her characterization of Walter Lee in Raisin and his later analog in the posthumous Les Blancs (1970), Hansberry challenges prevailing assumptions about black masculinity. 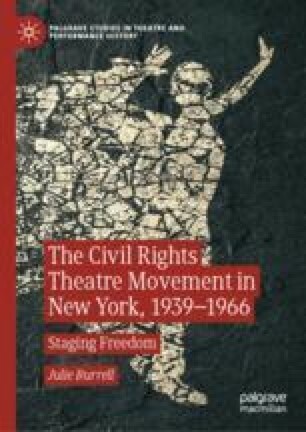 By analyzing the scripts and production histories of these plays, along with Hansberry’s essays in The Village Voice, Burrell demonstrates how Hansberry opposed stereotypes propounded by white liberals like Norman Mailer, who cast black men as violent and hypersexual. Ultimately, Hansberry transformed enactments of black masculinity on the American stage, creating a space for progressive black masculinities.